I’d hoped to get started on it over the work-week, but ongoing efforts related to getting my author’s website functional took time away from that. I’ve also got a large project to convert most of my existing short stories into eBook/Kindle format in the works, with my dual-goal being to establish a better archive of my stories and a presence on Amazon. But none-the-less, both combined into work that derailed my weekday evening plans. That said, I did get almost 2,000 words deep into starting Shadow of the Black Tower (as I’ve decided to title the Howard/Lovecraft tribute) over the weekend. At T minus four days and counting though, I just don’t have enough time to complete the draft before Saturday. Even if I dropped everything else, the very best I could hope for would be a slapdash result. I won’t do that as I want my tribute to these two authors —whose work has been an important influence on me— done properly and not as a hack-job. 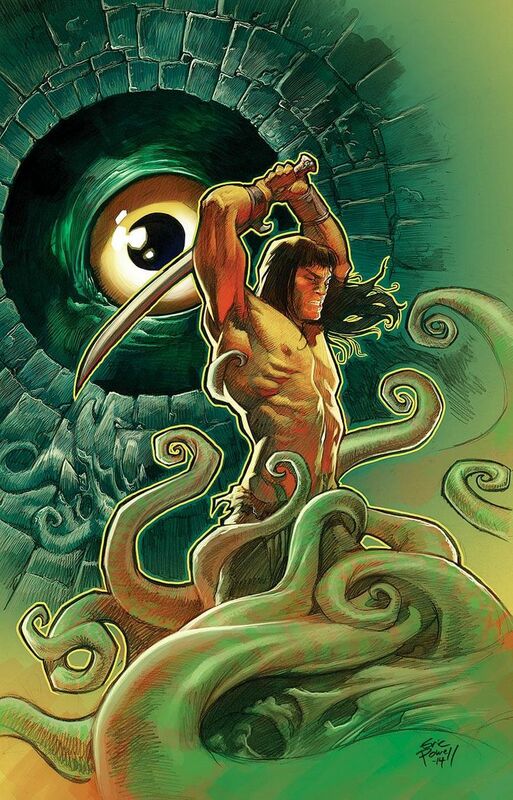 Conan Versus Deep Ones, by Jagoba Lekuona. Click here for more of the artist’s work! I’m happy with the opening scene I’ve established for Shadow, and my wife agreed that it introduced the principle characters and set the tone well. The tale’s main character is a scribe named Skalos who’s far out of his element a hundred leagues from civilization and upon the desert grasslands of Kush. Lured by the promise of gold and eldritch knowledge, he’s learned perhaps too late that his adventuring “partners” are cutthroats likely to betray him once he’s no longer useful to their aims. But knowing this, and that the black tower they seek to enter is a relic of abominable evil from an elder race vanished long before the dawn of men… he stays. No longer out of greed, but because of a hidden love he now shares with a silent slave girl bound to the will of the Hyperborean witch leading the expedition. 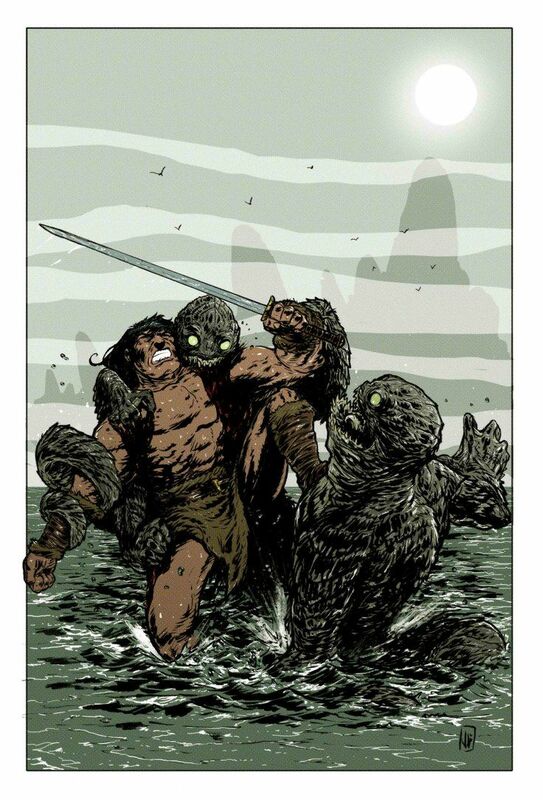 Skalos isn’t the fighting man of action RE Howard favored in his stories, and epitomized in his character Conan of Cimmeria. In fact, I’ve tried to make him in many ways the opposite: An academic, scribe and scholar much more in line with the types of characters Lovecraft preferred to write about. But unlike many of HP’s protagonists, Skalos’ intellect isn’t without portrayed emotion. His willingness to leave himself in peril to free a penniless slave shackled by decadent magic and civilization is very Howardian in theme. My contribution to Skalos’ character is his emotional nobility and devotion to his lover. That’s something rarely bushed upon in Howard’s works, and a theme absent altogether in Lovecraft’s. As a result, Skalos contends with very human dangers and concerns on top of his encounter with fearful, existential malignance. Xuthal of the Dusk, by Eric Powell. Click here for more of the artist’s work! My goal in Shadow is to do more than simply play out a Lovecraftian story set in the Hyborian Age. Instead I want to mix equal parts of a Howard styled adventure yarn with HP’s cosmic terrors. This may be a tall order, but I do have the edge that Howard’s stories usually featured supernatural or extra-normal threats. So I’m basically intensifying that into a dose of weird horror while using cues more typical of Howard’s usual framing around it. In other news, while Cretaceous Queen still awaits revision into a fourth draft before I hand it to a new reader, I was fortunate enough to get a third critique on Far from Acheron over the weekend. Feedback was mostly a handful of spelling or punctuation errors that she had caught, with a few grammatical or stylistic-tone related ones. All useful things to catch, and easy to address; I’ll be applying those changes to a fourth draft of the piece later this week.